As we close out the month of July, the weather in the Ozarks is seasonably warm with reasonable humidity. Great stuff! This weather is locked in for a while. I’m seeing our daily high temperatures maxing out around ninety-degrees today and this weekend. Also impressive are cooler overnight lows in the sixties while humidity stays in check. It looks like temperatures will increase a few ticks early next week reaching the lower nineties. 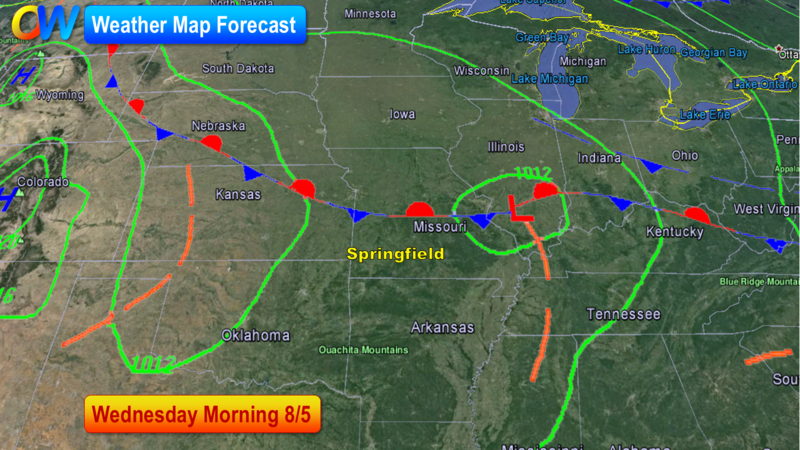 Forecast from Wednesday morning 8/5. 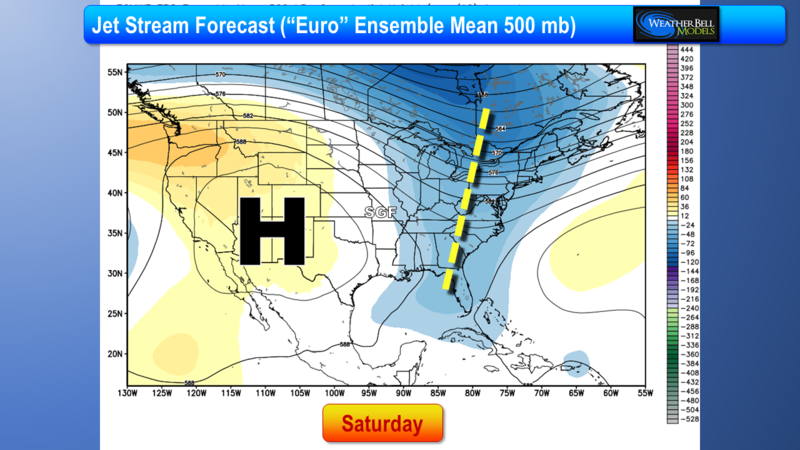 A cool front moves in by the middle of next week. 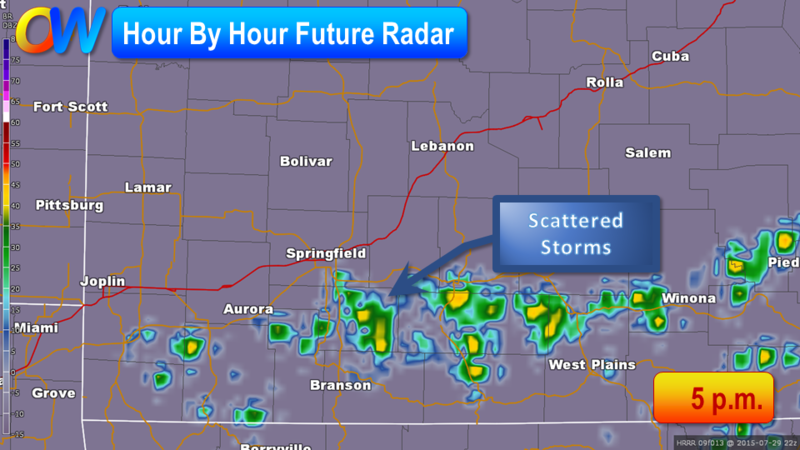 Showers and storms may form in connection with this feature. 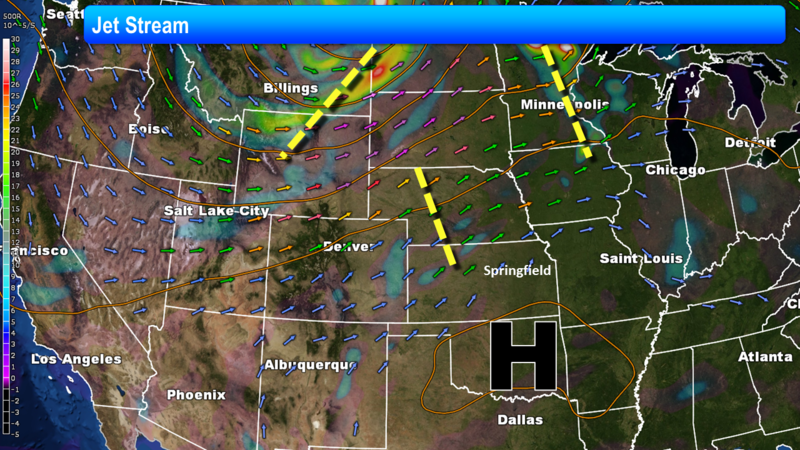 In summer, areas of high pressure are always welcome and today’s high is no exception! Through yesterday, Springfield recorded a week straight of ninety-degree highs, accompanied by “elevated” humidity. With the passing of last night’s cool front (producing essentially no rain), our high temperatures will back off, staying in the upper eighties to around ninety. Humidity will back down too with dew points backing down into the sixties. Overnight lows will drop into the sixties for several days to come which also helps out the mood, especially starting out the day! The weekend looks fairly normal as readings average right around ninety for peak temperatures. 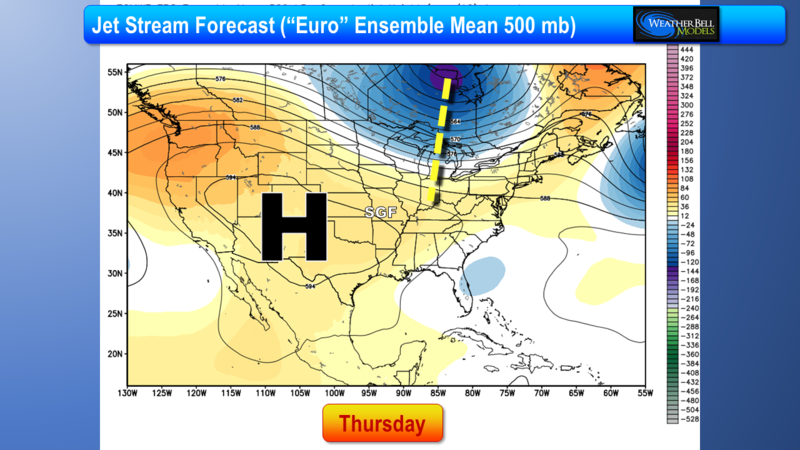 Heat may build up again slightly by early next week during the first few days of August. 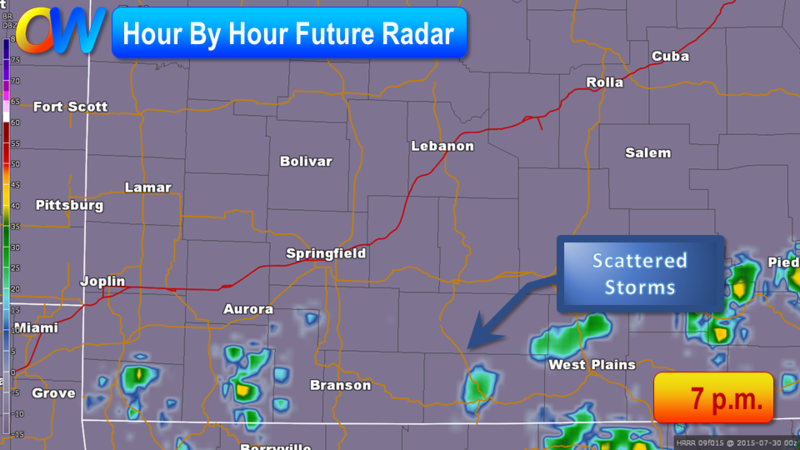 The next chance for rain in the Ozarks looks like Wednesday. 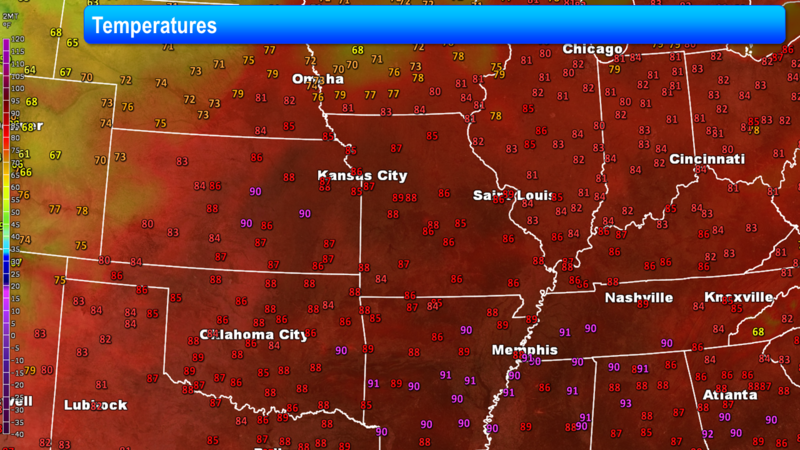 The Ozarks have had nearly a week of ninety-degree temperatures with some respectable humidity. This all starts to change tomorrow. In fact, some changes will even start today in the Ozarks has a cool front slips south into the area later this afternoon. Overall, the chance for rain is on the low side as this front passes through into the evening hours. 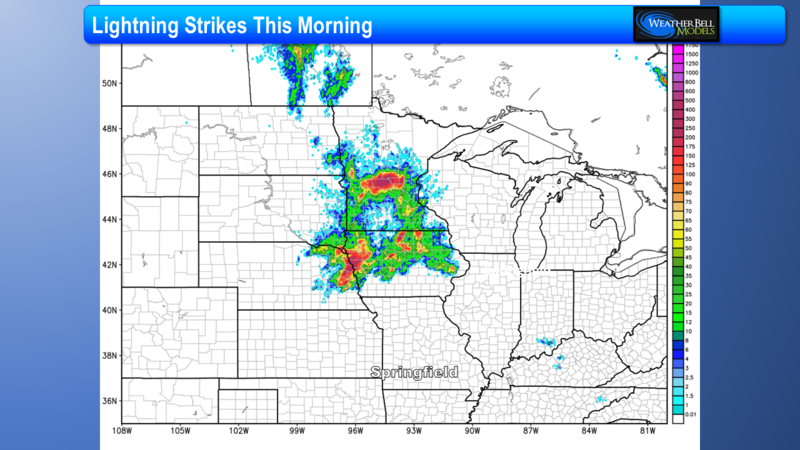 I don’t expect widespread severe weather to be an issue today or this evening. The good news is that the cool front will make a clean break of our area, allowing not only cooler conditions but also less humidity for the end of the week. Another point of relief is seeing overnight low temperature drop into the sixties. Overall, the jet stream flow aloft will favor a dry and cooler weather pattern for us for the rest of the week and evening into next week. Our latest run of hot temperatures will reach its hottest point today before readings start heading back down later this week. Today will be as hot as yesterday across the Ozarks. I see most areas reaching into the middle nineties. On Monday, Springfield reached 94°. Of course, it’s the humidity which is making things worse. The combination of heat and humidity will cause Heat Index (HI) values to reach to 100-105° today commonly. A few areas will see the HI climb close to 110° by late afternoon. 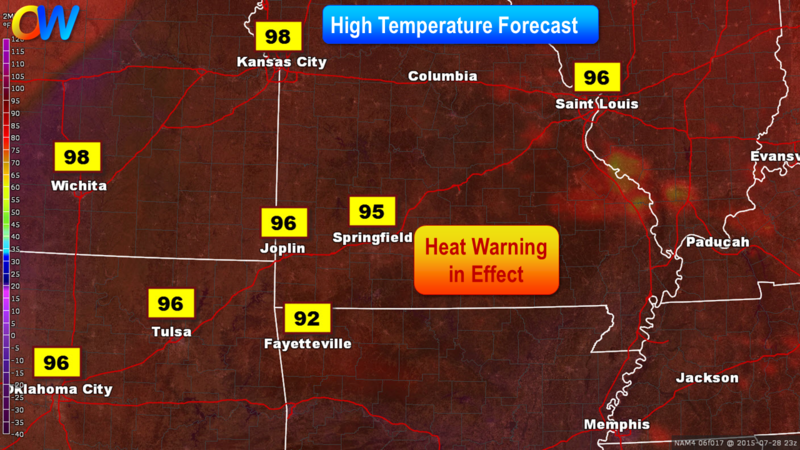 An excessive heat warning was issued by the National Weather Service for all of southwest Missouri today. 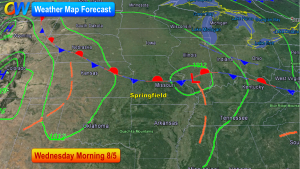 A cool front will start to change things on Wednesday. This front will shave temperatures back a tad starting on Wednesday and will also spark a few showers or thunderstorms in the Ozarks. Overall, the threat of rain is not very high in connection with this front. After the front passes, temperatures will be cooler for the rest of the week with highs staying in the upper eighties and lows finally dropping below seventy. 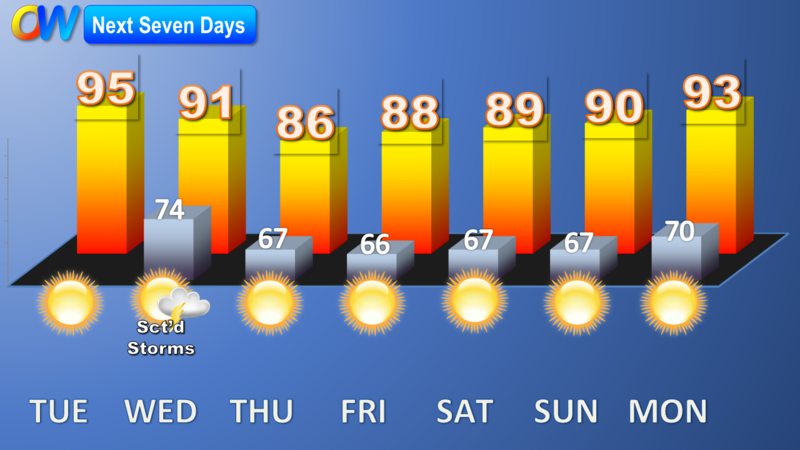 Even lovers of summer heat may not care much for the weather to start off this work week! Today and tomorrow will be hot days. I’m looking for the thermometer to peak in the middle nineties both days in Springfield. Humidity is what is pushing the heat to the levels of caution. Dew points are running in the middle seventies which is on the high end of summertime readings. The heat index will run between 100 and 105 degrees today with some areas west and northwest of Springfield heading as high as 105 to 108 degrees during the peak of heating this afternoon and early evening. A cool front will trim these readings back by the middle of the week. 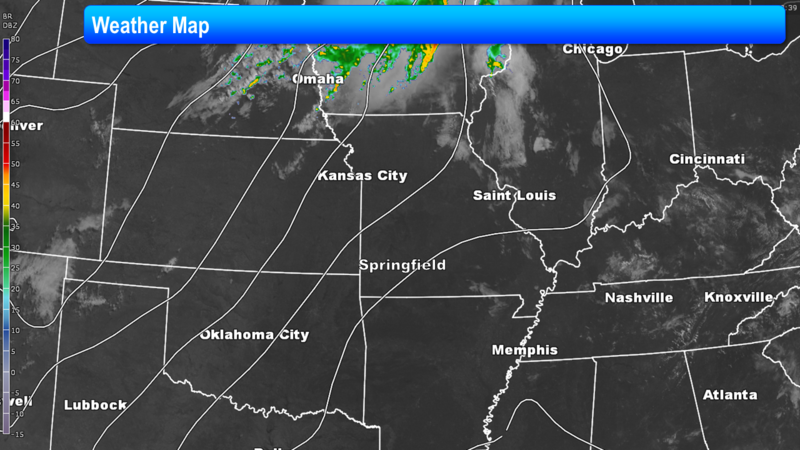 This front also has a small shower and thunderstorm potential attached to it late Wednesday. High temperatures will drop down to the eighties on Thursday and Friday, just in time for the opening of the Ozark Empire Fair! 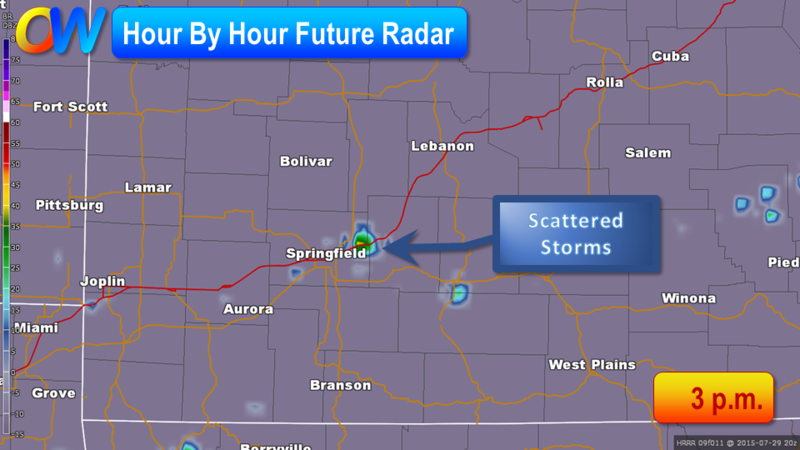 A heat advisory kicks in for Springfield and much of the area west and north of town today. Joplin and areas roughly along I-49 and points west are under a heat warning. The shower chances are gone now as a dome of warm air in the upper atmosphere build into the area. This will mean a run of high temperatures back into the 90’s starts today and will run through nearly all of next week. The humidity is running on the high side too and this combined with hot temperatures will send the heat index values into the 100-108° range during the afternoon and early evening hours today. This will probably be repeated for the next several days. There is still and chance for rain and thunder in the Ozarks today. 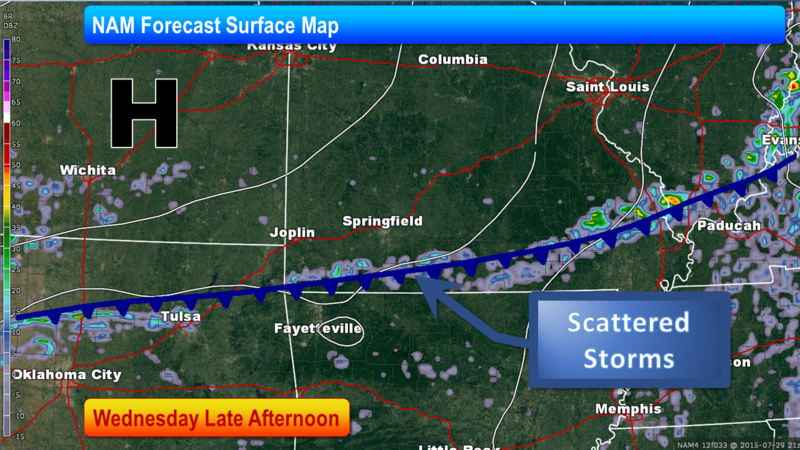 A warm front is lifting slowly north through the Ozarks. This features has been responsible for widely scattered showers and some thunder for the past few days. 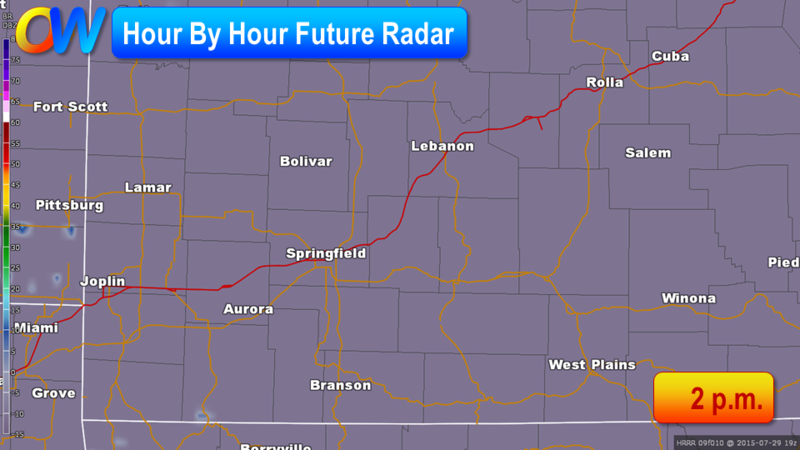 It will still affect the Ozarks today. 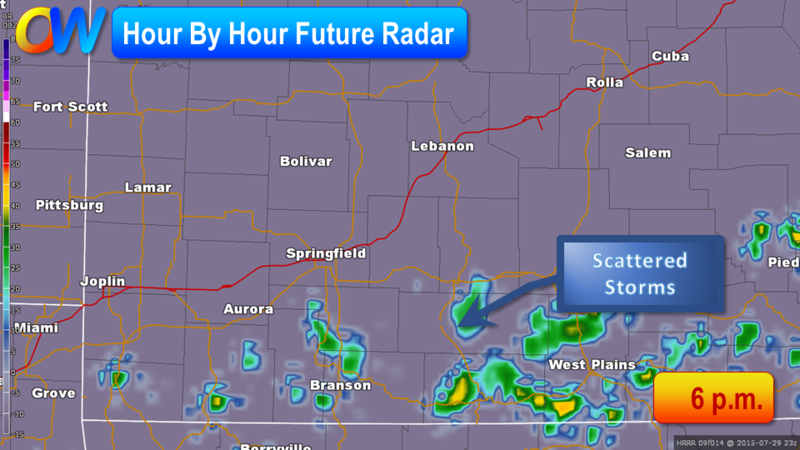 I think occasional showers and storms will be possible today, especially in the late morning and early afternoon hours. Some of the downpours with these showers could be locally heavy. By Friday, 90’s return to the area. 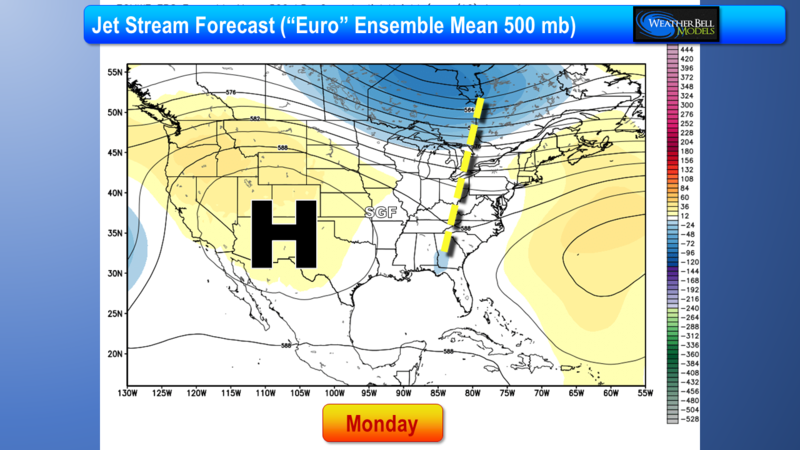 In fact, highs in the 90’s will stick around through the weekend and into next week too. 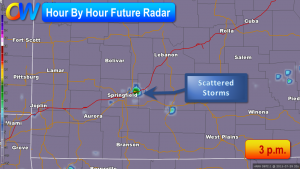 Rain chances are heading upward today through Thursday in the Ozarks. A cool front has cooled off the Ozarks this week and has also extended our chances for showers and thunderstorms as it slowly lifts back north as a warm front. Look for more areas of rain and some thunder today. The same chances for rain exist tonight and Thursday. Locally heavy downpours are possible. On Thursday, the rain-making system begins to move north of the area and the temperatures will start to rise once again. This weekend’s heat and humidity will be very close to what we experienced last weekend.